Natasha Skoryk looks at the impact of business events on their host cities, countries, the world at large, and for the event industry itself. The legacy footprint of events is best pictured as an iceberg. Floating above the surface, there’s the visible economic impacts made by visitors (this is primarily the revenue generated by the event attendees during the course of the event). Hidden below are the other economic impacts (many events provide a platform for businesses to generate revenue long after the event has ended). Finally, there’s the type of impact which is most difficult to measure: the indirect impact. The latter is naturally the largest section of the iceberg, yet remains largely unseen and is exceptionally difficult to quantify. 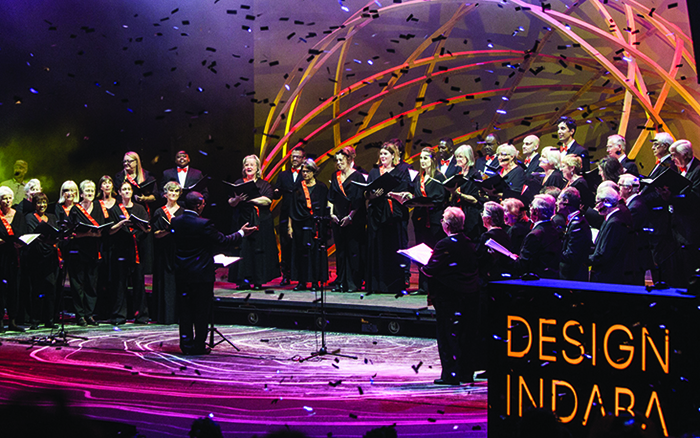 Design Indaba – held annually in Cape Town – is a major highlight on the continental and international creative calendar. This year, they are expecting to have 1 200 conference visitors and will be hosting four simulcasts of the conference. The latter is an exciting technological development which immediately grows the legacy – both visible and indirect – of any event that chooses to make effective use of it. Ticketed simulcasts generate money for the hosts, but they also allow a larger quantity of participants and attendees. Technology has paved the way to extend the potential impact of our eventing beyond the scope of what would’ve been imagined in prior decades. There is no need to imagine physical attendance will drop, but events increasingly need to think about including remote attendees if they wish to make a lasting impact. Remote attendance greatly ups the hidden impact of an event, because it exposes those around the world to ideas, thoughts and, in the case of Design Indaba, creative inspiration. Strategies for inclusion need to be limited to remote attendance and technologically savvy simulcasts. The 2018 MBA World Summit sought to make the event more inclusive by pairing up the international delegates with local township entrepreneurs. The international delegates were some of the world’s top MBA students, and they devoted time and energy specifically to helping local South African entrepreneurs overcome the structural challenges they face daily. The initiative was a resounding success. Still, it’s not all about the tech and development. Prior to the launch of simulcasts, Stratecon and University of Cape Town’s Graduate School of Business conducted a study on the economic impact of Design Indaba. As far back as 2015, it was generating around R235 million annually from ticket sales and revenue. Additionally, participants and visitors always spend money on accommodation, entertainment and various other tourism activities, which the study failed to measure. Research suggests most out-of-town delegates do not arrive on or leave immediately after the event, ensuring the Western Cape’s tourism industry benefits extensively. As those in the industry already know, a boom in business tourism and business travel does not only benefit MICE, but is felt by all members of the hospitality and tourism industries. As discussed earlier, however, the value of Design Indaba still cannot be reduced to a cold, hard, numerical figure. The event showcases a huge number of local entrepreneurs, artisans, thought leaders, artists and craftspeople and gives them access to a wider audience. There are specific examples of this: jeweller Tiffany Marx credits her business’s success to the exposure she received at the 2006 Design Indaba (when she had just graduated from her course at the Cape Peninsula University of Technology). Since then, her business has grown exponentially, and aside from operating a successful store selling bronze, brass, copper and silver jewellery in the V&A Waterfront, she takes on regular local and international commissions (and works with diamonds, gold and platinum as well). Tiffany’s business is a perfect example of a small, medium and micro-sized enterprise (SMME), a sector which has been identified as crucial to growing South Africa’s economy. “Entrepreneurs in South Africa and small businesses contribute to over 30% of South Africa’s GDP, so that is where this country is going to change in the coming years,” says Gwynneth Matthews, a Professional Conference Organiser. According to the National Development Plan (NDP), by 2030 government envisions a 5% annual growth rate for the economy, with a whopping 60%-70% of that figure being generated by SMMEs. In 2014, the South African government thus established a Ministry of Small Business Development, with express intention of growing the vital SMME sector. But government cannot accomplish this without the private sector. 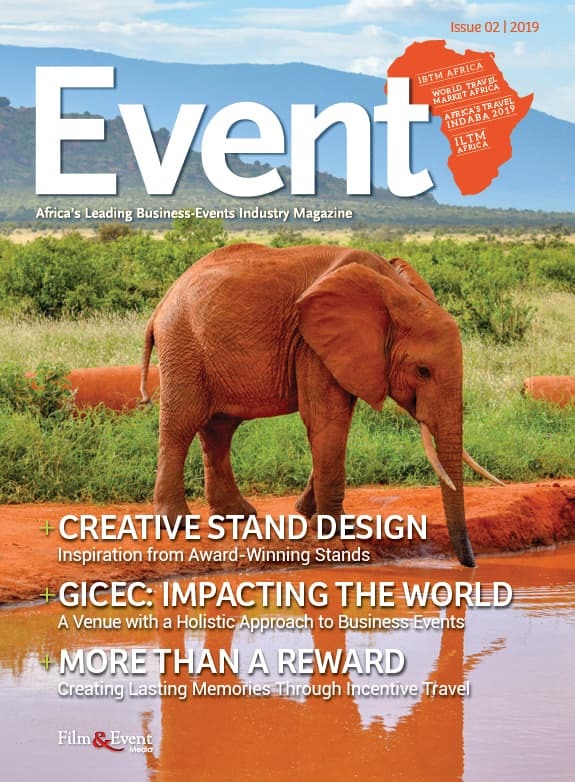 Business events, such as Design Indaba, contribute hugely to the growth and development of SMMEs, and continue their impact long after the conference is over. With technology making events like Design Indaba accessible from around the country (and perhaps soon from around the world? ), participants are given an ever greater platform. Decorex SA, now entering its 26th year of its show in Johannesburg, is another massive platform for SMMEs to develop. In 1994, they featured 144 exhibitors and attracted 26 000 visitors. By 2018, the event was attracting 57 361 visitors to 8 full halls of exhibitors! Their marketing manager, Zoe Van Niekerk, puts it succinctly: “Establishing an interior design company is a daunting undertaking for even the most talented professionals as it can prove challenging trying to stand out as a key player. In the past 25 years, Decorex SA has provided a much-needed boost for local careers as well uplifted the exhibition and event industry as a whole.” Decorex allows local entrepreneurs a major platform, and in turn, has been responsible for launching or boosting many careers. Decorex takes its social sustainability footprint seriously, and works to expand the reach of the event to directly assist disadvantaged communities. “Each year we also do a store room clear out and all old branding and items from the shows we donate to a local community for upcycling,” explains Zoe. Initiatives like these can extend an event’s footprint and leave a more lasting legacy, particularly at the lower levels of the iceberg. The knowledge and resources shared by events and meetings can effect real change across areas and communities, which is vital in developing economies such as South Africa. Also in 2019 they hosted the Thru The Chair Project where students from ReCreate re-crafted ordinary, everyday chairs into exquisite works of art. These re-purposed items were then sold to raise funds for sustainable projects which promote education in Africa. The latter project worked both to further social sustainability through charitable contributions and, as discussed earlier, to boost the profile of emerging SMMEs. The exact impact of Decorex’s charity partnerships and continued efforts at social responsiveness are hard to quantify in exact terms. Organisations benefit not only from donations, but from publicity and word of mouth. Who knows exactly how many visitors to the She Sheds at Decorex 2018 would go on to donate to Pink Drive in the next few years or decades? And, on a more individualistic point, who knows how many attendees were made more conscious of breast cancer and went on to have – potentially life-saving – mammograms? Another way in which events are leaving improved legacies is through a dedicated focus on environmental sustainability. No longer are organisers and planners trying to minimise damage; many events actively attempt to better the environment they’re in. For an international example, we can look to the 2012 Festival of Transitional Architecture, which was held in earthquake-wrecked Christchurch, New Zealand. Instead of attempting to minimise the effects of the earthquake, organisers transformed the city’s “red zone” into a party. 20 000 visitors showed up to explore this project in urban renewal. They also encouraged participants to think in terms of “radical sustainability” – that is to say, using only waste or surplus materials for construction. A focus on sustainability is not a cutes-y gimmick for organisers, as Christchurch has an abundance of waste and debris that it has still not managed to fully rid itself of. By focusing on the particular environment the event is hosted in, organisers can serve to improve it both during and after the event. It is imperative that event organisers begin to think more in terms of the many hidden impacts of their events, and incorporate it into the planning process. It is difficult to make lasting change if the ways that it can be made have not been fully considered. While there will still be positive impact – MICE is hugely responsible for growing developing economies, after all – it is possible to make a far larger one through design and careful implementation. Whether the goal is to make local events more inclusive and exposing more people to the ideas discussed there; sharing knowledge, information and inspiration across community and sector boundaries; driving economic growth through the development of SMMEs; or simply boosting the tourism sector through the endorsement of hotels, restaurants and tour operators, it is vital to consider the legacy ‘iceberg’ which your event will leave behind. Gary Grimmer, owner of GainingEdge, seems to sum it up best: “The business and professional events industry is actually a transformative strategy for countries that are trying to develop their knowledge and creative economies.” By employing this strategy, and focusing more intensely on MICE, countries across Africa can grow beyond our wildest expectations and plans. But it will take event organisers’ sustained efforts to do so.